The global change management software market was worth US$ 1,063.8 Mn in 2017 and is expected to reach US$ 3,294.9 Mn by 2026, expanding at a CAGR of 13.6% from 2018 to 2026. North America held the largest share of the change management software market in 2016. Change management software solution is a part of ITSM solution and is used to handle and track changes in the IT infrastructure. It helps reduce the negative impact associated with IT related changes on an organization. Increase in digital transformation and automation of IT processes and applications are expected to drive the change management software market. Complexities involved in the integration of technologies and toolsets is expected to restrain the market. However, growth of DevOps and rise in adoption of AI are anticipated to create huge opportunity for vendors due to the increase in demand for artificial intelligence and machine learning as value added features to their solutions. Additionally, advancement in wireless technologies, deeper internet penetration, and rise in the number of connected devices are leading to the growth of Internet of Things. This, in turn, is creating new opportunities for change management software vendors, thus boosting the market globally. The change management software market is segmented into deployment type, component, end-use industry, and geographical regions. Based on deployment type, the change management software market is further segregated into on-premise and cloud-based. The on-premise segment accounted for the largest share of the market in 2016. However, various organizations are adopting cloud-based solutions, especially small and medium businesses, due to increase in the number of mobile devices and surge in cloud-based and IoT applications. Moreover, shift from traditional systems to cloud-first approach among enterprise application buyers is expected to further propel the change management software market. Less maintenance and low costs associated with the cloud-based change management software solutions drives the cloud-based segment globally. In terms of component, the change management software market is bifurcated into software and services. The software segment is expected to hold the largest revenue share of the market by 2026. The services segment is expected to expand at the significant CAGR during the forecast period. Based on end-use, the change management software market is divided into Banking, Financial services and Insurance (BFSI), telecom & IT, government, education, health care, manufacturing, retail, and others. In terms of geographies, the change management software market is divided into North America, South America, Europe, Asia Pacific, and Middle East & Africa. North America is expected to hold the market share of more than 30% in 2026, followed by Asia Pacific. Expansion of the change management software market in North America is attributed to increase in cyber security threats, especially among the government and banking sectors. The market in Asia Pacific is anticipated to expand at the highest CAGR of more than 15% during the forecast period, followed by South America. India, China, and Japan are among the major countries driving the change management software market in the region. Furthermore, increase in digitization and rise in the number of connected devices are expected to drive the change management software market in Brazil. Moreover, as a part of the strategy, several companies are focusing on mergers & acquisitions to increase geographical reach. Major players operating in the global change management software market include ServiceNow Corporation, BMC Software, Inc., CA Technologies, IBM Corporation, Cherwell Software, LLC., Ivanti, Axios Systems, EasyVista Inc., Micro Focus International Plc, and Zoho Corporation. This report on the global change management software market provides analysis for the period 2016–2026, wherein 2016 is the base year and the period from 2018 to 2026 is the forecast period. Data for 2016 has been included to provide historical information. The study provides a comprehensive analysis of the market during the forecast period in terms of revenue estimates (in US$ Mn), across various geographies. 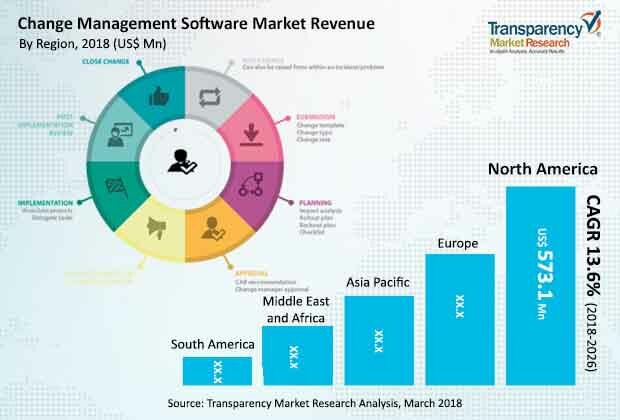 The report covers market dynamics including drivers, restraints, opportunities, and trends that influence the expansion of the global change management software market during the said period. Technologies that drive the global change management software market have also been considered in the study. The report also includes change management software functional model, Porter’s Five Force analysis that identify the bargaining power of suppliers, bargaining power of buyers, threat from new entrants, threat from substitutes, and threat from competition in the change management software market. Ecosystem analysis, which identifies key stake holders in the change management software market is also covered in the report. The change management software market has been segmented on the basis of deployment type, component, end-use industry, and region. Based on deployment type, the market has been further classified into on-premise and cloud-based. In terms of component, the market has been bifurcated into software and services. Based on end-use industry, the change management software market is divided into on BFSI, telecom & IT, government, education, health care, manufacturing, retail, and others. In terms of geography, the global change management software market is categorized into North America, Europe, Asia Pacific (APAC), Middle East & Africa (MEA), and South America; the regions are analyzed in terms of revenue generation. Furthermore, region-wise, prominent countries covered in the report include the U.S, Canada, the U.K., Germany, France, Japan, China, India, GCC Countries, South Africa, and Brazil. The change management software report also encompasses global trends, segment wise comparison matrix, market attractiveness analysis, and market positioning of key players for all regions covered in the scope of study. The comparison matrix includes segment growth matrix, 2016 – 2026 (%), segment revenue contribution, 2016 - 2026 (%), and segment compounded growth matrix (CAGR %). Market attractiveness identifies and compares segments market attractiveness on the basis of CAGR and market share index across North America, Europe, Asia Pacific, Middle East & Africa, and South America. Secondary research sources include websites, annual reports, financial reports, broker reports, investor presentations, SEC filings, internal and external proprietary databases, relevant patent and regulatory databases, national government documents, vendor’s whitepapers, statistical databases, market reports, news articles, press releases, and webcasts specific to companies operating in the market. The report includes competitive landscape which encompasses competition matrix, market share analysis of major players in the change management software market based on their 2017 revenues and profiles of major players. Competition matrix benchmarks leading players on the basis of their capabilities and growth potential. Factors including market position, offerings, and R&D focus contribute to the growth of the company. Moreover, factors such as market share, segment growth, infrastructure facilities, and future outlook increase the company’s growth potential. This section also identifies and includes various recent developments carried out by leading players operating in the change management software market. Company profile includes company overview, major business strategies, SWOT analysis, and market revenues for the year from 2015 to 2017. The global players profiled in the global change management software market report include ServiceNow Corporation, BMC Software, Inc., CA Technologies, IBM Corporation, Cherwell Software, LLC. Ivanti, Axios Systems, V EasyVista Inc., Micro Focus International Plc and Zoho Corporation.